She loved natural scenery and green plants, and then she encountered the vivid colors of bingata. Love at first sight, Sachiko Yafuso says, an excitement nurtured by her high school art teacher who introduced her to the bright colors found in bingata. Then only 15, she began studying, working not only with the earth tones, but with the brilliant colors saturating bingata. Simply stated, she was hooked. Yafuso loves her bingata, and will talk about it at the drop of a …well, piece of material. She encourages foreigners to sign up for bingata classes, saying “they can learn the process, and anyone can experience the craft at the Naha City Traditional Handicraft Hall,” referring to Tembus Hall on Kokusai Street, near Mitsukoshi Department Store. Bingata, she says, can be dyed with virtually anything, including silk, cotton, hemp, Japanese paper and even polyester. The materials Yafuso uses come from Tokyo and Kyoto, but she’s also stocking materials at her Yafuso Bingata Factory. The bingata artist is showing her creations through Sunday at Okinawa Market, located in the Camp Foster Concession Arcade. 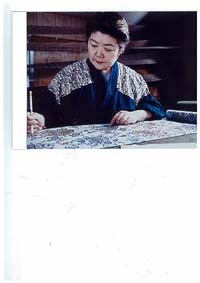 Yafuso likes working a variety of materials, and says the bingata kimono and obi take about two months to complete, while some things like table clothes and curtains take only two weeks. Her works include tapestries, table cloths, bags, ornaments and karayushi wear. Sachiko Yafuso’s products are on sale at Okinawa Market, and also at the Naha City Traditional Handicraft Center. She teaches bingata at her Issen Bingata School, as well as in Wakasa Public Hall, the Well Culture Center and in Okinawa City. Yafuso also takes time to demonstrate the bingata art to customers at Okinawa Market.